The main philosophy presiding over the Compañía de Tranvías’ business is based on respect for the environment, sustainable mobility and the application of universal accessibility systems throughout the fleet. These commitments are inherent to the company and they form the framework for our target of providing safe and unaided public transport for everybody, regardless of their physical, mental or sensorial condition. The Compañía de Tranvías’ philosophy includes respect for the environment and sustainable mobility. 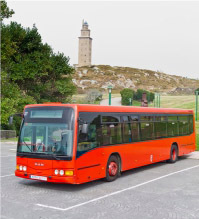 The latest vehicles bought in 2014 and 2015 are MAN ans Mercedes -Benz buses with EURO 6. EURO 6 technology is the strictest regulation for exhaust gas emission to date. The main emissions in EURO 6 are 0,4 gr/Kwh of Nox and 0,01 gr/Kwh of PM. For people with reduced mobility we have modernised the fleet, and 100% of our buses now have a single-level floor. In this way we make it easier to get on the bus for people with all kinds of difficulties, whether affected by mobility problems, people with children and prams and pushchairs. The kneeling system enables the vehicle to incline in order to facilitate access at stops. The inside floor is made of anti-slip material both when wet and when dry, and there are lights for getting on and off. Another method applied to facilitate access is the installation of fast and silent sliding doors, together with bars at the doorways, and different coloured bands on kerbs and the pavement to guarantee safety. 100% of the current fleet has a telescopic ramp with an outside button for wheelchair access. 100% also has a central platform for the disabled, with handles, a stop request button, back support, pictograms with information and inside ‘ramp in movement’ signs. The purpose of the audiovisual information systems on the buses is to provide service for those with limited hearing or sight. User information is complemented with informative audiovisual screens on the buses. The next-stop buttons are in Braille and there is access for guide dogs. 100% of the fleet has reserved seats for people with reduced mobility, with bars, armrests and greater width to make the journey more comfortable for such passengers and to give them more freedom of movement.